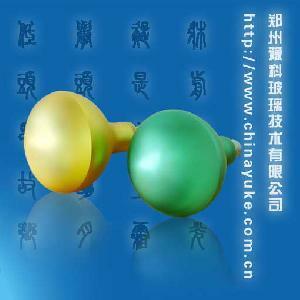 the further manufacture of the lamps, lamp ornaments, high boron and quartz glass, and other types of rigid glass. The technology procedure: Mix a proportion of glass frosting powder and nitric acid together, churn up the mixture fully, then submerge the await etching glassware into it for 10-20minutes, take it out, clean and dry it. The etching effect: The surface of the etched product feels smooth and delicate, the powder grain distributes on it is relatively big, it is also adjustable in compliance with the requirement of customers. Under light, the etched surface gives out tender luster, which satisfies customers� enjoyment. The output: Each kilogram glass frosting powder can etch the flat glass single-sided with the average glass material about 10 square meters.